This exhibit brings together two extremes of fashion. 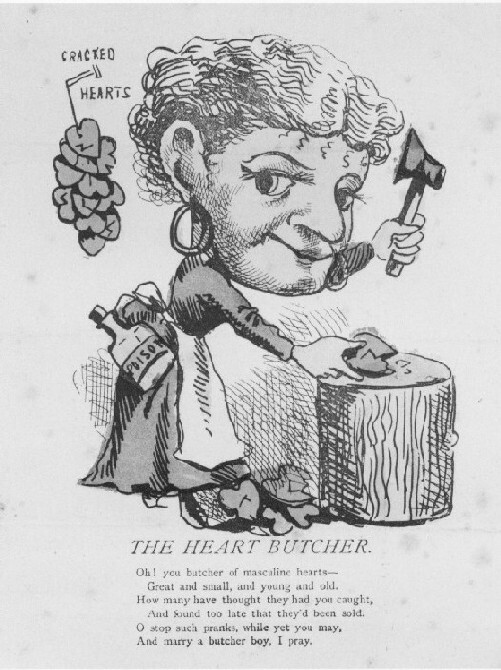 Included are highly ornate Valentine's Day cards that have long been recognized as the standard of the trade, and a wide variety of comic cards that run the gamut from the quietly humorous to the brashly insulting. Taken together, the selections in this show reveal much about the variegations of popular culture. The flattering cards in this exhibit are of the traditional variety. Cards with lace work and elaborate embossings are featured along with such unusual items as jewel box cards decorated with sea shells, and fold-outs that are in 3-D and resemble miniature stage settings. Among the insulting varieties are those that center around puns and plays on words such as the card shaped like the sole of a boot that bears the inscription "to a good old soul." Others feature atrocious caricatures painted in lurid colors and accompanied by rough attempts at poetry.